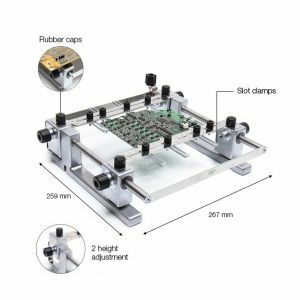 PHS-SA JBC Tools IR Preheater Support is perfectly adapted to any type of PCB by means of its many adjustable parts. It allows you to properly position PCBs of the same batch so as to always heat the same area. This means you save time and optimize workflow. The PH321 incorporates several slots for a total alignment to the PHS-KB IR Preheater Set. The user can modify the height of the support (75 mm or 96 mm) according to the working needs. It is also possible to use the 4 black rubber caps for reworking large PCBs.